I’m pretty excited – I sold 3 camera straps yesterday!!! The two Denyse Schmidt ones went right away, which doesn’t surprise me. I need to make some more of those RIGHT AWAY. 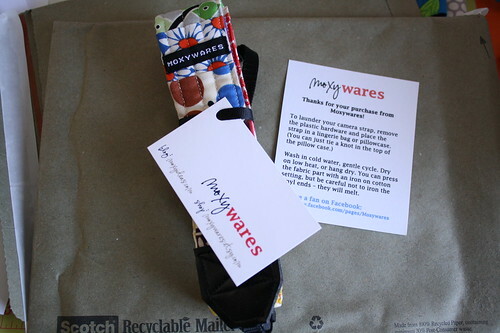 And an owl strap is making its way to Poland! So awesome! My sales were to NY, LA and Poland…how’s that for a little internet shop? Super cool. I’m working on my packaging – what do you think? It’s not perfect, but without making any kind of big investment – I think it looks nice. 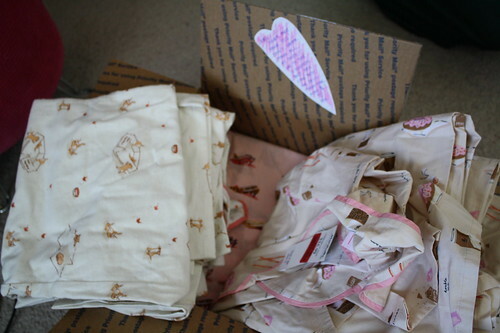 And even more exciting, my most wonderfullest friend, Pancockies, sent me a box of Munki Munki treasure. When I was on my serious Munki hunt a few weeks ago, she took up the challenge and scoured her own Marshalls…all the way in the Sunshine State! 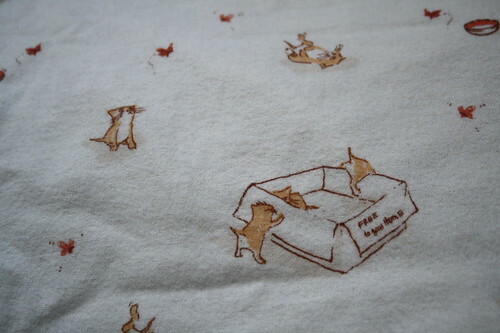 She found these adorable kittens, which I believe, are the find of the century. She also found a lovely shoes robe and a couple sets of coffee pjs. She is the BEST! Think a coffee camera strap is a good idea? I am so thrilled that you are selling your beautiful handiwork. Congratulations. I also get a kick out of how excited you get over fabrics. Keep on trucking. I think the packaging is very nice. The kittens are cute, but would you loose them with a narrow strap? Yeah, those kittens aren’t for camera straps. I don’t think flannel would work well for the straps…I think it will get pilly. But some patchwork munki munki straps made from the poplin prints are definitely in my future.